On July 16, 2017, Mr. Nice Guy was on his way to Long Island for a family BBQ when he was involved in a three-way car accident. He was driving in the middle lane and was struck from behind, pushing his vehicle into the rear (right passenger side) of the car that was in front of him. When the cops showed up, Mr. Nice Guy remembers being in shock and not immediately feeling injured. His car was totaled and towed away. The next day, he felt severe pain and went to the emergency department at Rahway Hospital. Mr. Nice Guy suffered injuries to his neck, legs, shoulders, lower back and right hand. He felt the pain in his neck tingle down both arms. Mr. Nice Guy suffered both a right and left shoulder strain and had a cervical spine sprain with spasms. He also highlighted nerve pain throughout his lower back and legs. When conservative treatment failed to relieve his persistent lower back pain, Mr. Nice Guy underwent two lumbar epidural steroid injections on November 8, 2017 and January 10, 2018. Mr. Nice Guy heard DJ Roy and Adam Handler on Irie Jam Radio. DJ Roy advised listeners to save Mr. Handler’s phone number in case of an emergency, and thankfully he did! 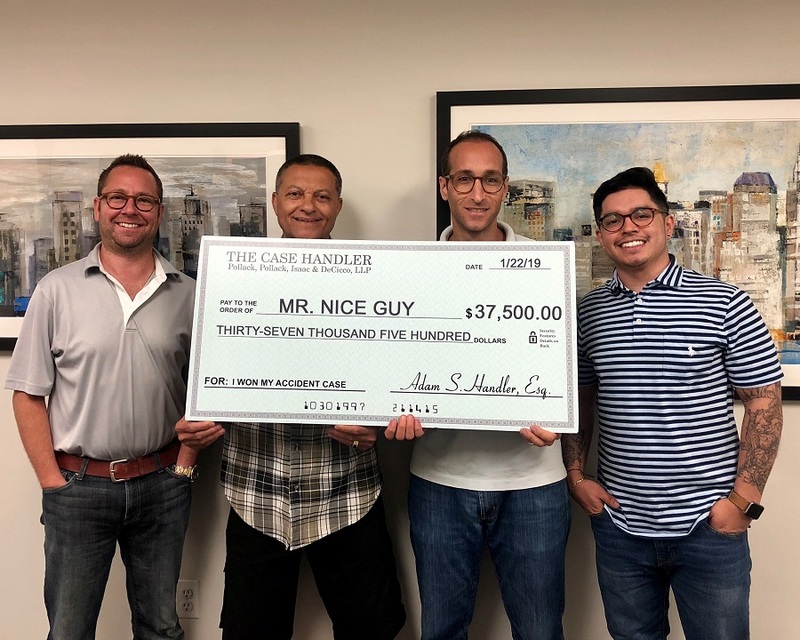 When the accident happened, Mr. Nice Guy reached out to The Case Handler team for a free consultation. He spoke to Ava and she told him to come in right away. While he focused on getting better and continued to work, our team handled the entire legal process for Mr. Nice Guy. The initial offer from the insurance company was $10,000.00. After their lowball offer, we not only declined…but we promised to call back in 8 months after Mr. Nice Guy finishes therapy to review ALL his bills. And just like that, The Case Handler team successfully recovered $37,500.00! Insurance companies are not easy to negotiate with. If Mr. Nice Guy took the original settlement, he would be missing out on $27,500.00! While there are a lot of factors that determine how much money an injured client can potentially recover, we highly suggest speaking with an experienced NYC personal injury attorney that can review your case before you say yes to any insurance company offer! If you or loved one are injured in a car accident, make sure you contact Adam Handler – The Case Handler today. You only have one opportunity to get the compensation you deserve; after all, so consider contacting a team that goes “that extra yard” for you. For a free consultation with The Case Handler team at Pollack, Pollack, Isaac & DeCicco, LLP, contact us online or call 929-223-4195.